Video clips have emerged of Chelsea star Willian discussing his future after yesterday’s Community Shield defeat to Manchester City. The Blues winger has been linked with Manchester United for much of the summer, with the Daily Mirror claiming just yesterday that the Red Devils were set to launch a late bid to bring him to Old Trafford. 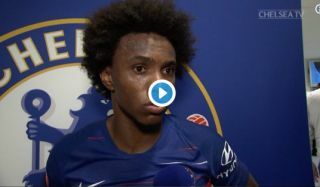 In a short video shared from Chelsea’s official Twitter page, Willian stresses that he wants to stay at Chelsea, though another clip from Omnisport shows the 29-year-old admitting he doesn’t know what will happen and that his transfer situation is down to his club. The Brazil international still suggests his preference is to remain at Stamford Bridge, but he doesn’t entirely rule out the chance of leaving amid rumours linking him with United. Check out @willianborges88's full post-match interview in the official Chelsea app! ?